Create big bends and play your guitar without fear to string breakage or loss of tune with Big Bends range of fretboard lubricants, including Nut Sauce and Gloss Sauce. Created by Jeff Massey, who wanted to stay in tune while playing songs like Riviera Paradise, on his floating bridge Strat, Nut Sauce soon became a huge hit with professional guitarists and guitar techs across the world. With impressive reviews from famous guitarists and guitar techs including Joe Satriani, Elliot Easton and Dave 'Pops' Clements, Big Bends lubricants are some of the best in the business. 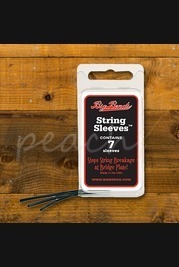 Designed to be applied to the nut, bridge, string guides and pivot points of the bridge, with a formula that doesn't drip, run or stain; Big Bends allows you to unleash your best riffs without confident that you'll be in tune and won't snap strings.